Many prenatal vitamins have a strong or overpowering aftertaste. Occasionally the ingredients in the vitamin just don’t sit well on the stomach. This can make swallowing these pills very difficult. Gel capsule vitamins may not be as pungent to expecting moms that are particularly sensitive to aftertastes. Some prenatal vitamins are so large they look almost impossible to swallow. If you have a sensitivity to larger pills, find one that is smaller. But be sure that that you are not compromising nutrition. 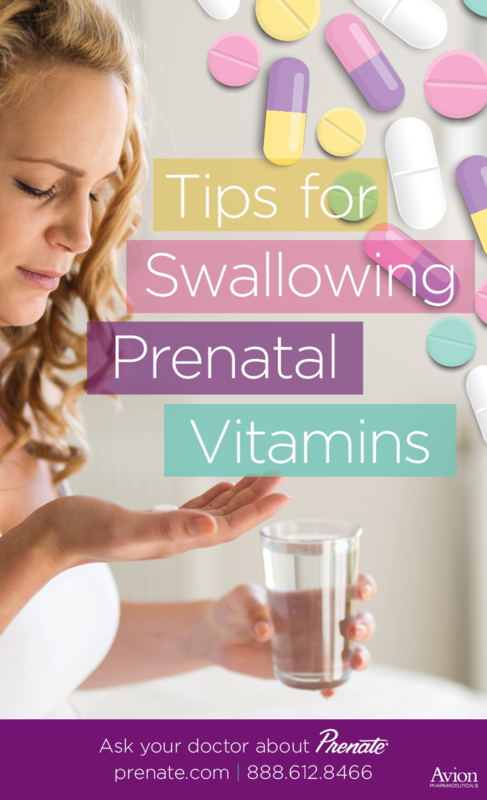 The Prenate® Vitamin Family offers several prenatal vitamin options for women that have difficulty swallowing pills. natural, Dutch-chocolate flavor in a nutrient rich chewable tablet. It also contains blueberry extract to accent the flavor while delivering antioxidant benefits. Prenate® Vitamins can help support mothers and babies throughout pregnancy and through labor and delivery. Even with a balanced and healthy diet, many women have trouble meeting their daily recommended intakes for certain vitamins and minerals. Talk to your doctor to see if a prenatal vitamin may be right for you to help fill nutritional gaps.